He may not be Crazy | Can Bryan Write? At first I was Pissed Off! Nissa ‘set me up’ with an email link to a sad story. 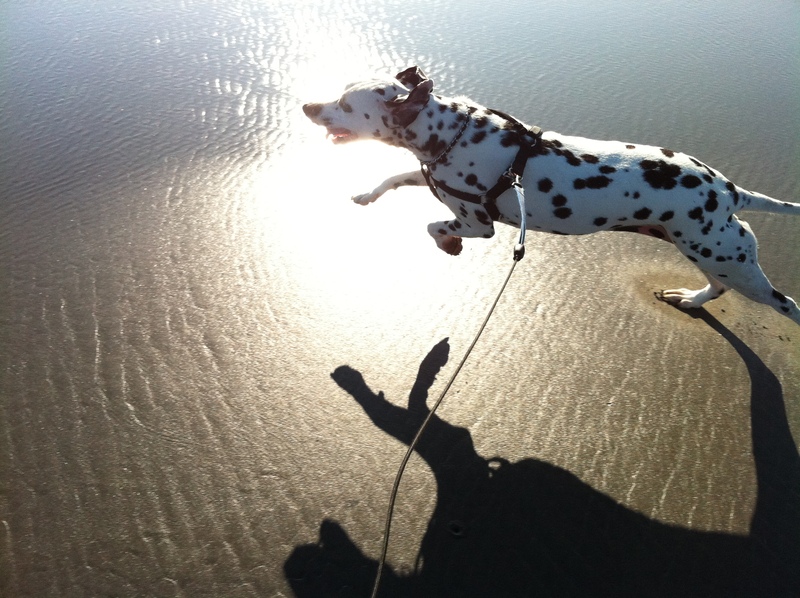 I was not ready for a dog, let alone another Dalmatian, I honestly believed that I would not have another. This caused my mind to race and all of the emotions Hit me, I was completely Consumed by this conundrum, for a couple of days. 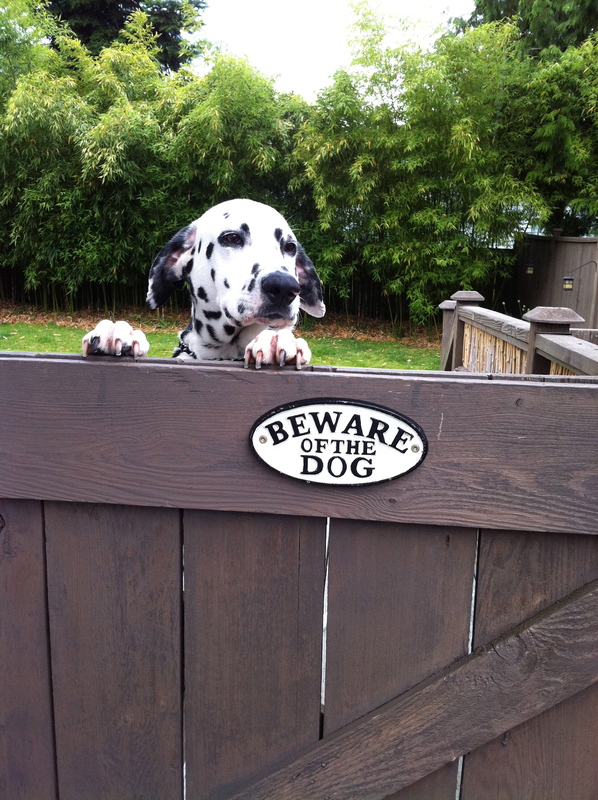 The story was put out on the web by Jodie Ray Kelley, who founded and runs the Dalmatian Rescue of Puget Sound organization. This posting was about a dog who was rescued for a financially impacted family in California, who could not keep the five-year-old Shelby and her brother. Seems California has a quick death penalty for dogs without homes so Jodie went down and brought a few back. Two of these dogs had been together since birth, so efforts were taken to find one home for both of them. After a few months of issues, the male was adopted, but not Shelby. Apparently she liked living with Jodie and learned that causing problems… got her returned. The post had a worn tone and a few pictures. There I was mentally; standing in a deep puddle of thick Sadness, heated by Anger and shouldering a heavy damp blanket of Guilt (for a dog I had never met, but could help). I went for a few long walks and tried to calm my mind, enough to let me find the best reactions. Later, I did let Nissa know that I was Irritated. We talked and I did some more searching… While trying to sleep on it, my mind worked over the situation. The next day I decided to let fate decide, a little. I typed up an inquiry and the required application for the possibility of adoption. I sat there and stared at the computer, with damp eyes. I went for a walk and talked to myself a little, came home and much like a; cliff dive, gnarly new ski run, first skydive, bungee jump or other self inflicted adrenalized moments that make palms sweat, I pushed the “Send” button. Instantly it hit me, I asked myself out loud “What did you do! ?” Later a reply came back that “Shelby already had an interested family”. I felt some relief and at the same time a little disappointment, but told myself that it was for the best. A few days later I got an email briefly explaining that the family didn’t think that it would work out, was I still interested? I went for another walk and replied, “Yes”. This time I felt better about it, but still apprehensive. We set a weekend day for the first step, to met the dog and go from there. The Friday night prior, I got a call that “The interested family had re-changed their minds and wanted to try again”. This hit a little hard and hurt, but I was still going with fate. Almost a week later, I got another email with a longer explanation about how Shelby definitely was not working with the indecisive family and was there any chance that we might still be interested? This rollercoaster process was excruciating, but I found the energy for one last turn, I replied and another semi-blind date was made. Looking back, being put through these sudden painful ups and downs sort of helped me work things out in my mind and show me that at least in part; I knew that I felt some desire to meet this dog. Rescue dogs have history, who really knows neither what nor how they interpret it. Shelby came with a reserved mellow attitude, like a foster kid, as if suspicious of the world. We shared a look and she showed a willingness to give me a chance by rolling over onto her back to let me rub her belly. Our meeting went well and while we were in the backyard, Jodie quietly left without a “Goodbye” in an attempt to make it easier for Shelby. I have no idea how she can handle this emotional part of her rescue service, but we are all better off because of people like Jodie. We agreed to have her stay for the required “trial period” of a couple weeks, to see if living together would work out. She did not bring whatever issues had kept her moving and homeless. Maybe Shelby found a sense of belonging, or a purpose that the other places lacked. As I suspected, she chose to keep us and we eased forward. It turns out that Shelby and I made a good pair; both worn down by realities of life, skeptical and unenthused. We drew some energy from each other and got a little better, we continue to get better. Sharing with cats is never easy for a dog, let alone later in life. With a little quick feline toughness, stubborn human guidance and canine willingness, in time… our animals friends learned to live together. Again, Rah occasionally tests his game, but in a much appreciated awareness of the noticeably greater risk. Eventually the persistent magical powers of the ocean and its beach took over, suddenly. on a sunny walk Shelby’s eyes lit up and she launched! into a full speed gallop. It felt good to observe this shared passion come alive in her. To my relief, Shelby and Sarrah have little in common other than obvious similar instinctive traits, looks and a bond with me. Where Sarrah was a smaller version of “perfect”, Shelby is a much larger version. Shelby’s additional twenty five pounds give her much more power and torque, pulling me forward. Shelby is mostly quiet. She does not have the range of vocal expressions, and would rather quietly observe with silent strength. She fiercely feels a need to protect me from, well, the rest of the dwellers. It is as if she senses that I am distracted by damage and commands respect for our space. I am certain that they would have not liked each other on the same life plane, but maybe a Spirit Dog has an advantage, a power to overcome. 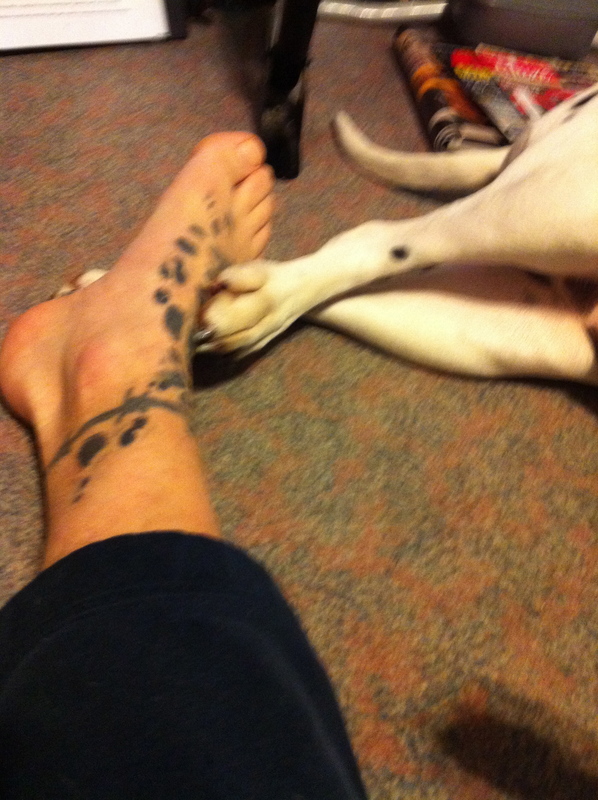 Perhaps Shelby had help holding out to find me. This life experience reminds me of another lasting question, “?Who Saved Who”. 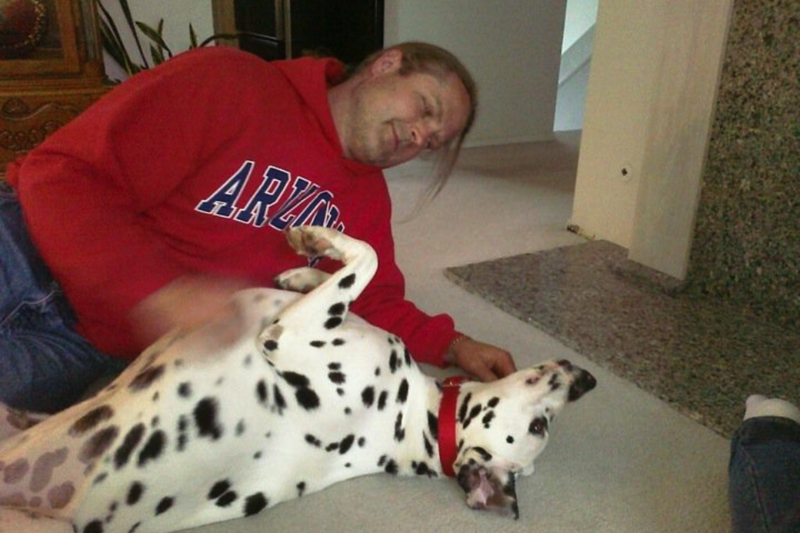 If you see a guy walking a Dalmatian, talking to two, he may not be crazy. 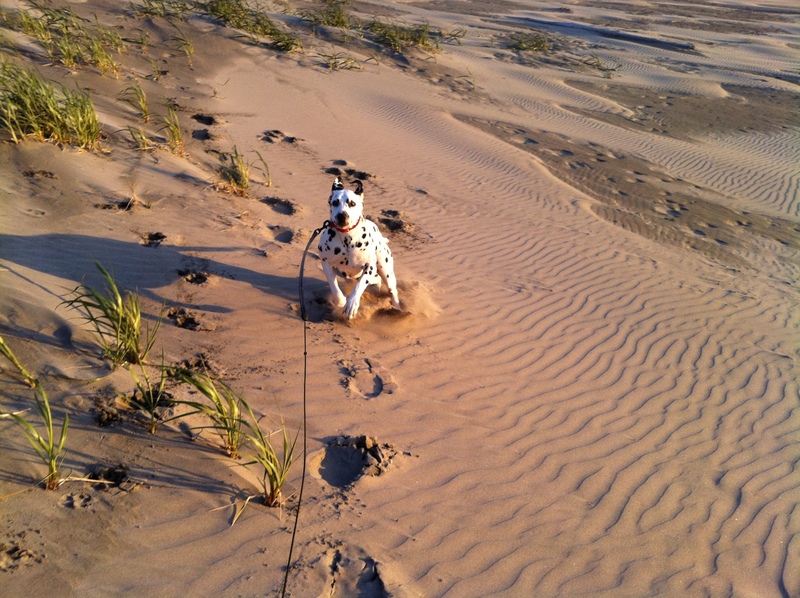 This entry was posted in Shelby ReSaved and tagged Beach, Change, Dalmatian, Discovery, Dogs, Introspection, Moments, Pals, Pets, Pictures, Relationship, Speed. Bookmark the permalink. A wonderful post! I’m so glad you found each other. What a great story. The pic of the doc on the water is gorgeous. Hope you have a long happy life together. I’ve often wondered “Who saves who?” I hope your journey together continues to be full of joy! I would say this qualifies as a happy story!